London 2012: Kayla Harrison Completes Comeback From Sexual Abuse With Judo Gold Medal : The Torch Kayla Harrison has defeated Britain's Gemma Gibbons in women's 78kg judo, winning the first gold medal for Harrison, 22, and the first gold for an American in judo. For Harrison, it's also an emphatic triumph over another challenge: overcoming a sexually abusive relationship with her former coach. U.S. judoka Kayla Harrison reacts after winning the women's 78kg gold medal at London's ExCel arena. 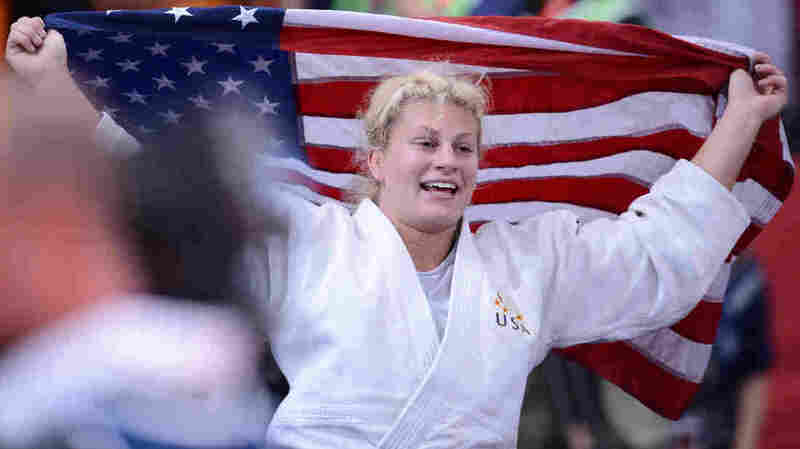 Kayla Harrison has defeated Britain's Gemma Gibbons in the women's 78kg judo final. It is the first gold medal for Harrison, 22, a native of Middletown, Ohio — and the first Olympic gold medal for an American in the event. Harrison sprang out to an early lead in the match and then sealed it with another late score. She holds multiple world champion titles, despite her young age. You might recall Harrison from an earlier post here on The Torch. In it, Karen Given of WBUR described Harrison's tough training, her resolve to win, and the painful path she's taken to the London Games — which included overcoming the devastating betrayal of her former coach, who sexually abused her. Update at 11:33 p.m. ET: In the five-minute match, Harrison won by recording two yuko scores, throwing Gibbons twice. The first score came just under one minute into the match; the second came with only one minute and one second remaining. "Gibbons leaped into the arm of U.S. Olympic Coach Jimmy Pedro, who took her under his tutelage six years ago at Pedro's Judo Center in Wakefield, Mass. Pedro, an iconic star as a U.S. competitor, had come up short in his own bid for Olympic gold. But he shared the medal and a massive hug with Harrison Thursday." Harrison's mother sent her to train with Pedro after her daughter, who was then 16, revealed the abusive relationship with her coach. "Do I wish that everyone would just talk about how, you know, awesome I am — and how I could be America's first gold medalist?" she told WBUR's Karen Given. "Yes, I wish that. But America wants that comeback kid story. They want the person who overcame obstacles to reach their goals. And I fit that bill pretty well."